The Poem Farm: 2013 Progressive Poem Begins Here! 2013 Progressive Poem Begins Here! 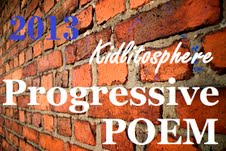 I welcome you to the 2013 Kidlitosphere Progressive Poem! Last year, Irene Latham invited poetry-lovers to share in a progressive poem feast which she kicked off at her blog, Live Your Poem, on April 1, 2012. Day-by-day, throughout April, different people took turns hosting the growing poem, each adding one new line. Our poem gathered lines and stanzas, and on April 30, 2012, it was complete. What fun it was to see the poem twist and turn and become, just as a poem by one person does. I was fascinated each day to visit the next host...curious as to how each writer's heart would bend the meaning and sound. Today I am very happy to have the opportunity to write the first line of the 2013 Kidlitosphere Progressive Poem. On Irene's advice, I leave my line without punctuation - open and ready to fall into the arms of Joy Acey. Please follow along, visiting each blog as this one line grows to thirty poem breaths, a community poem written by poetry friends old and new. Watch a poem grow day-by-day as it travels across the Kidlitosphere! April 1-30. To see day one of my personal April Poetry Project for this year, click here! Paying attention, taking a walk...where will this lead? I am SO happy to be part of this community this year and to Irene for letting me be a guest blogger on her site!! Love the first line, Amy. great first line! I'll pop in regularly to see where the sounds of footsteps head. SALUD! Will be interested to see where this goes. I never had a chance to stop by and say thanks for kicking us off with such a great line - so many places we could go with it! And I thought you did a fine job with your pineapple...you've got a better eye than I think you realize. One thing I'll always remember about pencil drawing from my many art classes in college: draw the light, draw the shadows...the picture will create itself. Best wishes for a productive poetry month! Is there any Property Mentoring in UK who is going to give you any training with guaranteed project? If you are going to find that too with the training isn’t that will be a great opportunity for you? with extreme level of knowledge in properties. Making money is a tough work, in fact very hard work. training are going to make you eligible to fight with any critical situation.